The National Sleep Foundation’s (NSF) latest Sleep Health Index (SHI) finds significant associations between technology use in bed and sleep health.Forty-eight percent of American adults reported using a device like a computer, tablet, or smartphone in bed before trying to go to sleep. These people averaged 2 points lower on the overall SHI (75 vs 77, on a 1 to 100 scale) and 5 points lower on the sleep quality subindex (65 vs 70) than those who refrained from technology use in bed. More alarming is the 21% of American adults (representing 52 million people) who reported awakening from sleep and using an electronic device before trying to go back to sleep at least once in the past 7 days. These individuals averaged 10 points lower for overall sleep health and 13 points lower on the sleep quality subindex than others (68 vs 78, and 57 vs 70, respectively). Unlike in previous decades when smart technology was basically more of a dream than the reality that it is now, people slept early because they have nothing better to do once night time falls. They don’t have gadgets that can keep them entertained all night long and no Internet to make them forget the distinction between day and night. People back then certainly got their recommended 8 hours of snooze daily without any problem at all. But that can’t be said today. You won’t even be able to recognize that it is night if not for the total darkness that envelopes the land. 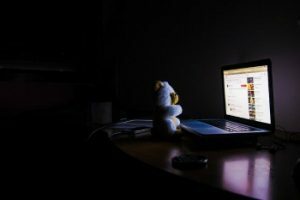 Even that subtle glow from our electronics can cause us to suffer a delay in melatonin, which is a sleep inducing hormone. Most people don’t know that the amount of sleep we get plays a direct role in the overall state of our mental health and cognitive abilities. Sleep is not something to be taken lightly – it is not a mere luxury. We often think we can make up for lost sleep but no, it isn’t possible. Sleep isn’t a luxury you can afford to not have or miss out on. It’s basically the fuel that keeps us going every single day. Food and water alone are not enough to sustain us. Over time, our bodies will give in to the exhaustion and demand for rest. Sleep serves that purpose. By temporarily saying goodbye to your woes in life, your body gets to recharge and rejuvenate while you are in dreamland. There are no ifs and buts. Technology takes that away from us. We get so engrossed with whatever is on our smart gadgets that we easily lose track of time. Unless your sleeplessness is caused by a medical condition, don’t underestimate the benefits of sleep for your health. We should be responsible enough to care for our bodies and not compromise our health just because we want to have a good time. By setting a schedule and seeing it through, it will be easier for you to resist those tech temptations surrounding you and set your priorities in life straight.